This card, which in reality is a real certification, performs the function of describing the specimen, to certify the quality and guarantee authenticity. The price is the result of a proper processing of the correspondence between the degree of rarity, the conservation status and other variables of the coin. Check with your smartphone the online certificate! To improve the security of our clients, we have included in the new card also a QR code. With this innovative system, the possessor of money can read the descriptive certificate of full currency, the former references and photos of straight and reverse, thanks to a QR reader in this simple and free application on both iPhone, iPad, iPod that of smartphones (Android). This web code at the bottom center of the card and subscription to the store allow you to view the online certificate even those without the application QR. Check the online certificate from the card! The Moruzzi Numismatica is proud to be considered the first numismatic company in the world, to ensure their coins without having to be sealed, as happens in the United States, in rigid plastic (slab). We know that Italian collectors, as well as the majority of those in Europe, wish to have direct contact with coins in their collections, and we have reason to believe that our innovative methods of certification and warranty, will find wide application in the most qualified companies numismatic (both Europe and the Orient). 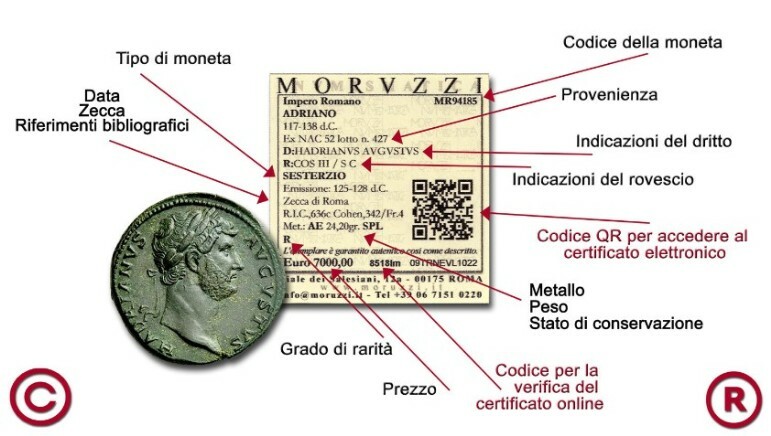 The online certificate of Moruzzi Numismatica, which allows you to check, thanks to high-quality photos, the origin and the quality of the coins that come from our company, represents a significant step forward in transparency and safety of the purchases. The paper certificate that is still released and sent for online purchases is enhanced with the QR code to also check on the internet and through applications designed for iPhone, iPad, iPod and smartphones (Android), or by accessing the web through the code shown indicated. 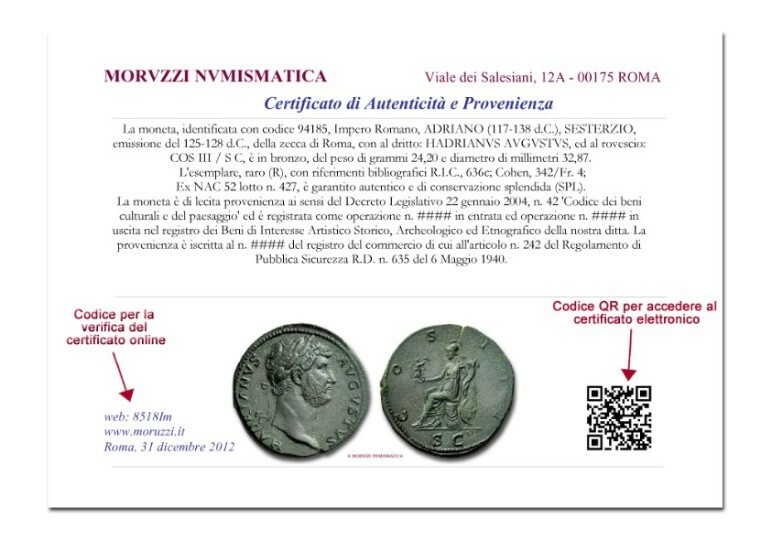 It possible to ask for coins, medals and banknotes purchased at the Moruzzi Numismatica from 2009, online certificate that includes the new card with the QR code and photo certificate for only € 8.00.